So despite the cloud cover, with it really being the only chance I would have for a few weeks to try, I loaded up the Tundra of Love and headed to the SHSU Observatory to take a run at Comet Lovejoy. It was patchy when I arrived, but promising. A large fire fueled by something unknown raged to the south. The light polluted skyglow from New Waverly/Willis/Conroe was punctuated at the treeline with an eerie orange glow and plume of black. The winds were favorable and Pleiades was near zenith, so I continued setting up my rig and performing polar and star alignment. Georgia‘s parents bought me an amazing zero-gravity field chair for Christmas, so I waited out the meridian flip and enjoyed stargazing with my hand-me-down binoculars through holes in the clouds. Since the comet was about 9 degrees or so off Messier 45, I knew that ones The Sisters had transited the zenith, I could start my data acquisition. In a serendipitous moment, the skies opened up and the blanket of stars seemed to brighten. It was a good night. 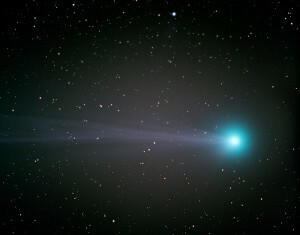 Comet Lovejoy was discovered in August 2014 by an amateur astronomer in Australia named Terry Lovejoy. It’s actually the 5th comet he has discovered, so “Lovejoy” is more or less what people are calling it because it happens to be here now, but the actual designation is C/2014 Q2. I has already passed opposition (last week) and is headed toward reaching perihelion (closest approach to the Sun) on January 30. Once it begins the journey leaving our planetary region, it will have an orbital period of about 8000 years. So, if you think there is a chance you might not be here in 8000 years to check it out next time around, you may want to peek outside during this flyby. As it turns out, this data was a lot trickier to integrate than DSOs like galaxies or nebula. We are still spinning and orbiting… none of that has changed… but the comet is moving quite rapidly through space (relative to the perspective of massive celestial bodies thousands, if not millions, of light years away). This actually requires the data to be processed in two parallel paths and then merged at the end. The comet and it’s ion tail are stacked “at their speed” and then a linear fit and starmask is used to map in the background field from the same exact frameset. I know there is a ton of room to improve, but it isn’t too shabby for my very first comet… imho.